My Mother-in-Law requested a Banana Cream Pie to celebrate a momentous birthday. I was happy to oblige. Bill is the one who loves banana cream pie at our house. Peach, apple or raspberry with a nice scoop of vanilla is more my style. But when I snuck a sample of the Tom Douglas’s vanilla custard recipe I whipped up for the filling, I knew this pie was going to be extraordinary. No boost of banana flavor in this custard, just a layer of banana slices sandwiched between a rich concoction of sugar, eggs, whole milk, cream, vanilla bean seeds, and vanilla extract. The bowl of vanilla specked filling became my new best friend, it’s that fabulous. Jane has been my mother-in-law for 30 years. Warm, generous with a heart of gold, we hit it off from the day we met. She’s truly a gem. Like her middle son, she has a knack for storytelling, leaving us in stitches as she regales us with tales of motherhood and anecdotes from years of owning a pharmacy in a teeny-tiny town. After hearing horror stories about friends’ mothers-in-law, I know I’ve been blessed. She requested a banana cream pie for her 90th birthday (shhh, don’t tell her I revealed her age on the Internet!). Though she barely weighs 90 pounds, she devoured a generous slice. 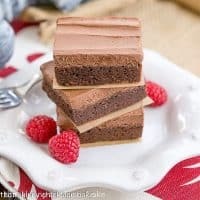 You won’t be able to resist this amazing dessert, either! 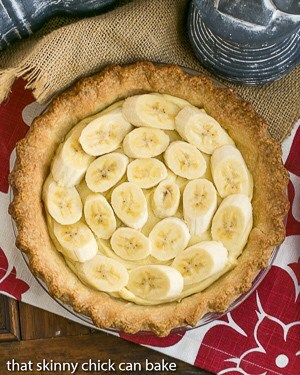 A luscious banana cream pie made with Tom Douglas’ vanilla custard. Split the vanilla bean lengthwise and scrape out seeds. Add vanilla pod, milk and cream to a saucepan. Set aside vanilla bean seeds. Whisk sugar and cornstarch together in a large bowl. Add egg yolks and vanilla bean seeds. Whisk until mixture is smooth and lightens in color. Heat the milk and cream mixture till it almost boils (you will see small bubbles around the pan’s edge). Remove from heat and discard the vanilla pods. While whisking, slowly drizzle a scant cup of the hot liquid into the egg yolk mixture to temper the eggs. Then slowly add the rest of the hot liquid continuing to whisk until smooth. Return the mixture to the stovetop and cook at a medium temperature, whisking constantly, until very thick like pudding. Adjust heat to prevent scorching if needed. Remove from heat and stir a few times till mixture cools to about 140º. Scrape mixture into a food processor, then add the butter and vanilla. Pulse until butter is melted and custard is smooth and glossy. Remove to a bowl and set over ice water, stirring occasionally till cool (I fill my sink partway with ice cubes and water). Cover surface with plastic and refrigerate at least 3 hours. Scrape about half the custard into prepared pie crust. Arrange banana slices over custard, then top with remaining custard. Whip cream with powdered sugar and vanilla. Top pie with whipped cream. Best eaten on the day it is made. Check out my Pies, Tarts, Pastry and Pavlovas Pinterest Board for more inspiration. 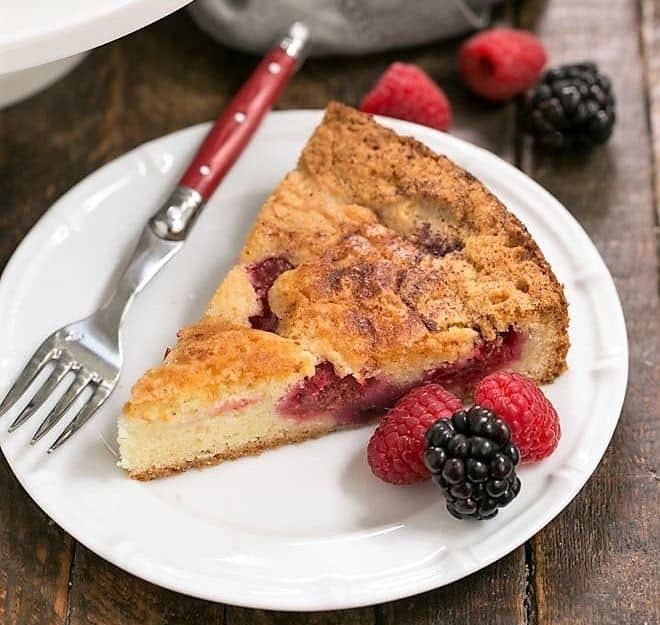 What a delicious pie for a dessert! I would love a slice with my afternoon tea!! It looks GREAT! I am not a super huge pie fan – until it comes to custard…then you have me glued. 🙂 I love Banana Cream Pie. My mom used to make it often. Yours looks DELICIOUS! I love all kinds of pies from fruit to banana cream. This looks fabulous! I am also very tiny and people are always surprised how much dessert I can eat, but when something is great it’s hard to resist. Banana cream pie is my mom’s favorite and this recipe is sooo beautiful–I love the flecks of vanilla bean you can see! I associate banana cream pie with a long gone restaurant int he village of the family cottage. I made one finally a couple of years back. 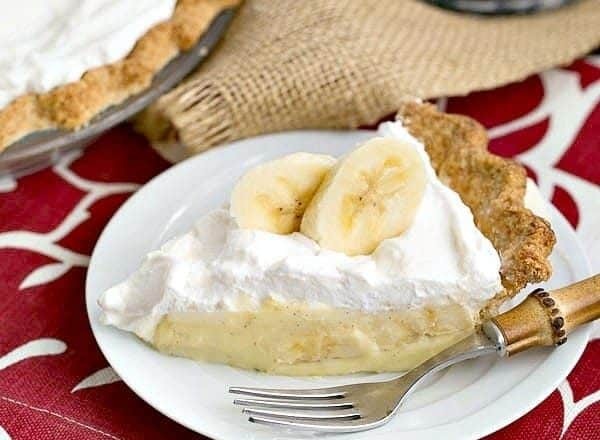 Every time I see a banana cream pie I salivate…like now! What an exquisite pie, I love the vanilla custard! That recipe sounds like a winner!!! So wonderful that you made it for your special MIL – such a sweet story! I too am so blessed to have had a wonderful MIL – she no longer recognizes us but we love her dearly. Yum, I love banana cream pie too. This one looks delicious. 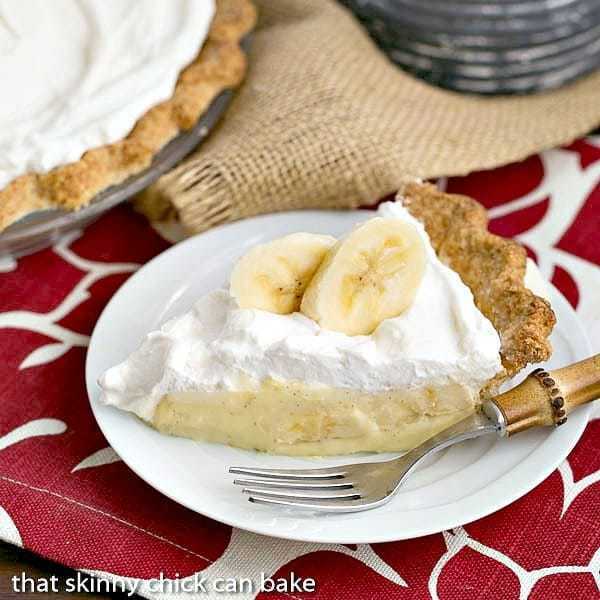 I absolutely love bananas and you banana cream pie would be a perfect Sunday dessert idea! Mniam! If you said is the best one, I believe you, it must be gorgeous ! Love like Bill banane pies 😉 Happy weekend ! 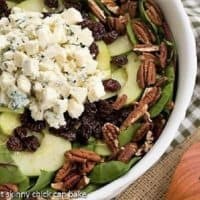 Wow Liz, this is simple yet bold and looks delicious! The natural flavor of the banana is a perfect compliment to the sweet cream. Yum! Happy birthday to your MIL! That’s a fantastic milestone. 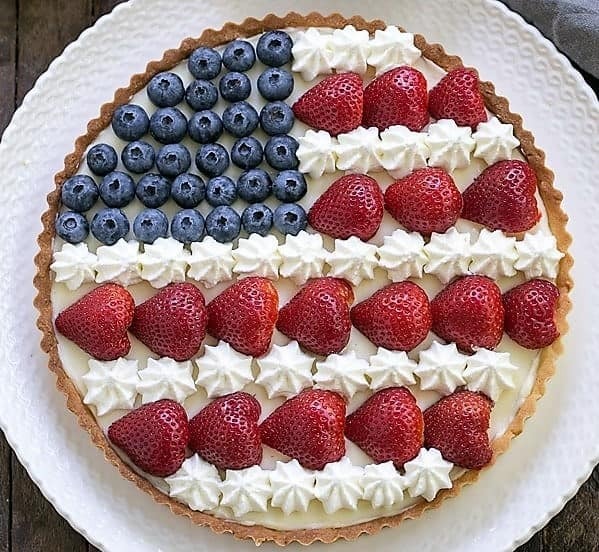 This pie looks amazing – I bet it tastes amazing too. Dear Liz, I must admit that I have never tried at hand at a Banana Cream Pie but the recipe is tempting – nice buttery pastry, vanilla custard and bananas and a very pretty presentation. Who could possibly ask for more?! I haven’t had banana cream pie in years! My father was a big fan of the frozen one, and it wasn’t so great. I’m sure he would have loved this. Hope your MIL had a wonderful birthday! I’ll need to hide this from Bobby or else I’ll be making it for him tonight! This is his all time favorite pie and since YOU say the “best ever”, then it’s got to be. Thanks Liz! 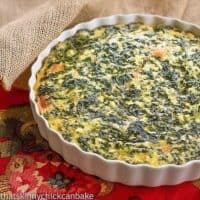 This is my father’s favorite pie, too! When they were here for Passover we went to a sushi restaurant and they had it for dessert. It was a large slice and my dad is quite small-well, he ate the whole thing and wouldn’t share. I was amazed! Thanks for this recipe, Liz. 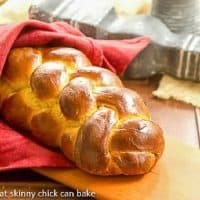 I can’t wait for them to visit again so I can bake it for him! I dropped by tonight because I wanted to copy your version of the monkey bread. I saw it flash by while I was in route home but for something that delicious, I have a good memory. Other things, not so much. But, in strolling through your recent posts, I discovered this BCPie. My mom made the best, best, best BCPie ever. So, I am missing her tonight and this week-end but think I will put this together sometime this month. Once I’m settled, with time on my hands, this is happening. Also, the monkey bread. For sure. Your MinL was blessed to have you also, Liz.